Customer Review for "Ohropax Classic Wax Earplugs"
Excellent product. Used them for years. Keeps out the noise exceptionally well. My first choice. Very comfortable and very good soundproofing. Took me a while to get used to them, but since then they have been my best choice for earplugs. I use Soft too when I need less soundproofing, but Classic are just for everything and everyone. Thanks a lot to Sleepstar for getting them in stock and delivering fast to me. What a difference these have made. Wax earplugs are the way forward! They block out so much sound and are so much more comfortable than the other kinds. Really good buy! This product saved my life. It is easy to be used and can be shaped perfectly into your ears. I have very small years and with this product I could make the ear plugs with a personalised shape and size for my ears. Fantastic product! I have used these earplugs for many, many years. I used to have to buy them in Germany: so glad they are available here now. I also have small ears and one earplug is enough for both when torn into 2 pieces. Very comfortable. Tried others but found them completely useless. I was so delighted when I saw they sell these earplugs in amazon. I got my first pair from a Swiss friend and it has lasted for two weeks. At first I looked at the little lump and through "weird!". The waxy material does leave a very thin layer of residue in the ear but I find it very easy to clean. The earplugs come wrapped in wool, which at first does leave lint mixed in but it integrates with the wax after moulding it into shape. I keep them in their case to avoid dust and lint sticking to them and if you clean your ears every day, these earplugs will last clean for many days - reusable for sure for more than a week! I can't hear a thing and feels very comfortable as opposed to foam pushing your ear walls trying to expand. I sleep extremely well now next to a snoring husband and snoring dog! Absolutely the best. Soft, malleable, will bear a good number of wearings. Best of all, HIGHLY effective! Does considerably more than it says on the box. Great for blocking out loud TV noise from an annoying neighbour! Takes some getting use to putting into the ear and how tacky the wax becomes. But very comfortable and effective and able to finally get a good nights sleep. More suitable for smaller ears. Will be purchasing them again. Normal ear plugs (the kind airlines give out on long-haul flights) rarely fit in my ear, and when they do, the fit is so loose it does not seem to make much difference sound-wise. These wax earplugs, however, are the perfect solution! 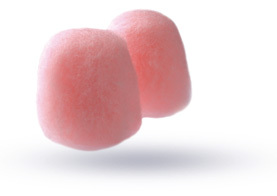 You roll them up in your fingers to make them slightly soft and then basically seal off your ear canal from external noise. My family and I used them on holiday over New Year's as we had read reviews of our accommodation stating that it was situated in a 'lively, bustling neighbourhood' (i.e. very noisy at night). Although there were many bars blaring out music, and people chatting and drinking in the streets, I shut out all the sounds and slept completely undisturbed. If normal foam earplugs do not work for you, then I really cannot recommend these enough. Very comfortable earplugs, I would recommend these plugs to anyone. Delivery is excellent! I've been buying these plugs for the last couple of years now. Wouldn't purchase them from anyone else.